That is a great choice, and so cute! :o) I'm sorry he has already gone. Thank you. They look so funny as babies. All giant feet and head. And thanks for the sympathy. I love my little rodent pets, but it's heartbreaking how short their lives are. That's a great choice, and I love the names. We had hamsters when I was a child who were Hamlet 1 and Hamlet 2. Cute! My childhood hamsters were mainly a series of Samsons, called Sam most of the time. I'm hammie-less now, but most recently I had Poppy, R2 and Princess Pushinka, aka Puff. Gerbils are adorable anyway, but baby gerbils are especially so. I think it is a perfect response - he does look like he is wearing a big white lace collar. I'm glad I'm not the only one who thinks so. I think this marking pattern is particularly pretty. Awwww, how adorable! I love the white markings. What a sweet little darling! 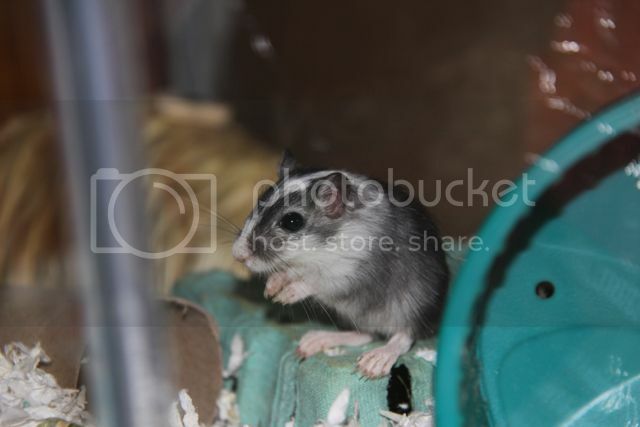 He was a cutie, but I find gerbils in general adorable. They're either sleeping or busy, busy, busy. So much fun to watch.